A woman who claims she was healed by prayer had to battle the benefits system to stop her disability payments. Officials said the computer did not "have a button for miracles". June Clarke, 56, from Plymouth, Devon, slipped on a wet canteen floor at work in January 2000 and badly damaged her hip, pelvis and lower spine. 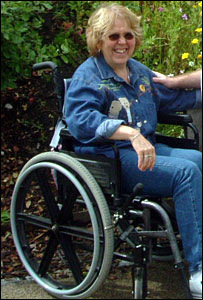 Last year she says she received healing at a Christian conference and within hours she was able to fold away her wheelchair and stop taking painkillers. When Mrs Clarke realised she was completely healed she contacted the government Industrial Injury Department to put a stop to the benefits she had been receiving, but the payments continued. Mr and Mrs Clarke sent letters and made phone calls, but officials told them the system was unable to recognise an apparently miraculous recovery. Mrs Clarke had been awarded an allowance for life and the computer was not programmed to allow that payment to end while she was still alive. After six months, she saw an official government doctor who registered her as fully fit. The allowance was stopped and Mrs Clarke was able to repay the money. A spokesperson from the Department for Work and Pensions said: "Each case is treated individually."